The PID-5 Inventory of the American Psychiatric Association evaluates personality and related disorders based on the dimensional trait model (DSM-5 Section III), which guides individual diagnosis and therapeutic needs. We analysed its usefulness as it was applied to patients that had been referred to a Day Hospital for Personality Disorders. In the sample of 85 subjects, 51 % had Borderline Personality Disorder (BPD), and 47 % had Personality Disorder NOS or Mixed (PD-NOS/MP), 65 % presenting comorbid clinical disorders. Among the BPD group, 89 % were women, 53 % were under 30 years old; they presented a PID-5 profile of greater severity, the Negative Affect and Disinhibition Domains stood out, as well as the facets of depression, impulsivity, anhedonia and distraction. Their borderline symptoms (BEST scale) were of greater intensity, they used fewer symptom coping strategies and more avoidance strategies (COPE-28 inventory). Among the PD-NOS/MP group, 58 % are women, 80 % were aged over 30 years, and negative affectivity, especially anxiety, stood out in their PID-5 profile. Both groups show borderline and avoidant features in the IPDE screening. The PID-5 was useful for confirming specific diagnoses (BPD), for describing the trait profile as well as proposing the specific therapeutic needs of both BPD and PD-NOS/MP patients. Personality Disorders (PD), as a single diagnosis or as a comorbid disorder have become increasingly important in Mental Health, due to their high prevalence in the clinical population. According to the Diagnostic and Statistical Manual of Mental Disorders, DSM-5 from the American Psychiatric Association (2014), prevalence rates for a personality disorder reach 9.1 %. It is estimated that between 30 and 60 % of these people have a Borderline Personality Disorder (Mental Health Forum, & AIAQS, 2011). As García-López (2010), points out, this scenario has brought about an increase in specialised attention for PDs, especially in the case of Borderline Personality Disorder (BPD), which has led to an increase in the time dedicated and the resources allocated to them. Consequently, it is necessary to have valid and reliable clinical diagnosis systems of these disorders, in order to adequately plan the treatment and evaluate its results (Echeburúa, Salaberría, & Cruz-Sáez, 2014; Esbec & Echeburúa, 2014). Section II of APA's 5th edition of the DSM, currently the most influential diagnostic system in the selection and evaluation of patients in clinical trials, provides a revision of the Categorical model for these disorders. From this perspective, personality disorders are qualitatively different clinical syndromes. They are divided into three groups based on descriptive similarities, Cluster A (paranoid, schizoid, schizotypal), Cluster B (antisocial, borderline, histrionic, narcissistic) and Cluster C anxious or fearful (avoidant, dependent, obsessive-compulsive). The category "Other Specified Personality Disorder" is included when an individual presents traits of various disorders, but does not meet the criteria for any specific disorder (e.g. Mixed Personality characteristics). "Personality Disorder Not Otherwise Specified" (PD-NOS), is included when the individual presents general criteria for a personality disorder that is not included in the DSM-5 (e.g. passive-aggressive PD). As the DSM-5 points out itself (APA 2014), this model is useful in some research and teaching contexts, but some of its limitations hinder its practical application. First of all, the study is carried out in a clinic, in which people frequently present concomitant personality disorders from different groups or clusters. Therefore, “Other Specified Personality Disorder with Mixed Personality characteristics” (MP), and PD-NOS categories, end up being a frequent diagnosis in patients to be treated. The Categorical model supposes an added problem for treatment, since these groups are usually excluded from clinical investigations. Hence, it would be difficult to validate specific treatments for patients or obtain clinical guidelines based on evidence. An alternative is already included in Section III of the DSM-5. This particular research model, comes from the Dimensional model and is a hybrid model. It aims to preserve the continuity of the current clinical practice and addresses the deficiencies of the Categorical model. The model is based on empirical research and meta-analysis, which is based on the revision of the trait models in psychology, Big-Five or Five-Factor Model of Personality (Goldberg, 1990). Although this model has traditionally been a matter of controversy (Anderson, Snider, Sellbom, Krueger, & Hopwood, 2014), some authors have focused research efforts on delivering results on the advantages of the Dimensional model (Thomas, Widiger, & Presnall, 2013). On the other hand, it could be considered that the Five Factor Model is predominant in the study of personality from a psychological perspective, as it continually seeks its implementation in clinical practice (Caspi, Roberts, & Shiner, 2005; Costa & McCrae, 1992). From this model, the DSM-5 considers personality disorders as maladaptive variations of personality traits, which blend imperceptibly with normality and with each other (mixed forms). These features are dimensional and have two opposite poles, thus assuming continuity between the normal (adaptive or resilient), and the pathological (maladaptive). They fluctuate throughout life as a result of maturity and / or experiences. In order to diagnose a Personality Disorder, "pathological features" and the main areas of "functioning personality" must be assessed. The APA provides the Personality Inventory PID-5-Adults (Krueger, Derringer, Markon, Watson, & Skodol, 2012, 2014), a specific instrument that enables traits (dimensions and facets), to be assessed by providing a "personality profile" (adaptive and maladaptive features). This assessment points towards Specific Disorders characterized by a specific profile of pathological features (antisocial, avoidant, borderline, narcissistic, obsessive-compulsive and schizotypal). However, it also includes the Personality Disorder Trait-Specified category (PD-TS), making it possible to adapt the description of the personality profile of each individual, including subclinical and mixed formulations. Therefore, it is more descriptive and useful in practice than the classic "Other Specified Personality Disorder with Mixed Personality characteristics” and “Personality Disorder Not Otherwise specified" category. On the other hand, according to the DSM-5, the PID-5 is an instrument that can help us to determine the specific needs of intervention for a specific case, as well as helping to assess the results of said intervention. The aim of this piece of research, is to analyse the usefulness of applying the PID-5 and the dimensional model to describe the traits profile and to guide in the diagnosis of these disorders. Moreover, to aid in establishing the specific therapeutic needs of patients who are referred to a specialized centre. This piece of research was carried out in the Day Hospital for Personality Disorders at San Juan Hospital, Alicante. The centre addresses disorders in clusters B and C, especially Borderline Personality Disorder. The starting point is the observation of a high frequency of patients referred to the centre diagnosed with PD-NOS/MP. It is believed that the traits profile description, put forward by the PID-5, would allow for the identification of the specific intervention needs of the PD-NOS/MP group and determine whether they are different from the needs of the BPD group. This information could help to adapt the necessary therapeutic components for each subgroup, as well as retrospectively assess the results obtained in the intervention. Between June 2015 and January 2018, a total of 115 patients were referred to the San Juan Mental Health Day Hospital from several Mental Health Units. 69 patients belong to health area 19 (Alicante Province - General Hospital), and 46 belong to area 17 (Alicante Province - Sant Joan d'Alacant). Out of the 115 patients, 79 of the patients are women and 36 are men. 19 dismissed the application (7 women and 12 men), and 11 did not meet the criteria required to enter the program. Therefore, the incidental sample (not randomized), is composed of a total of N = 85 individuals. With regards to the Clinical Diagnosis for which they were referred to the day hospital, out of 85 individuals, 51 % are diagnosed with Borderline Personality Disorder, 47 % with Personality Disorder Not Otherwise Specified or Mixed Personality (PD-NOS/MP), and only 2 % with Other Personality Disorders (Obsessive-Compulsive Personality Disorder and Histrionic Disorder). The socio-demographic profile of these patients would be as follows. By gender, 75 % of individuals are women, compared to 25 % of men. The average age is 34.5 years old (range between 18 and 54). 40 % are less than 30 years old, 31 % are between 30-40 years old, 21 % are between 40-50 years old, and 8 % are over 50 years old. Regarding their living situation, 63 % of the people seen continue to live in the family home, and 24 % live alone or with their partner. There is no data for the remaining subjects. When considering educational levels, 24 % of individuals haven't obtained a basic education and 13 % have. 32 % have studied at intermediate level (BUP, baccalaureate, vocational training or training courses), and 8 % have university studies pending completion. Only 5 % have finished university studies. There is no data available for the remaining 18 %. In relation to their economic situation, 58 % lack their own economic income. Regarding their employment situation, 68 % are unemployed, 18 % have jobs, of these, 15 % work occasionally and 3 % have a temporary occupational disability status. 8 % of patients have a National Social Security Institute acknowledged permanent occupational disability, and 26 % have an acknowledged disability. The structure of the evaluation in the Day Hospital is more complex, as it considers both individual assessment and assessment of the program itself. However, for the purpose of this piece of research, the main focus is specifically on the instruments that allow for a profile of users cared for in the centre to be determined. In order to select the instruments, certain factors were taken into consideration. The instruments needed to be precise, adequate, up to date, useful, reliable and valid. In the data collection referred to below, the patients consent was obtained. The patients were assured that their personal information was confidential and were informed of how this information would be used. Initial assessment, Semi-structured interview. The most relevant information for the assistance in each case was collected. The Referral Sheets were taken as a reference point. Socio-demographic and clinical data was extracted from these interviews along with data related to admissions and visits to the emergency department in the last year. International Personality Disorder Examination, IPDE Module DSM-IV, WHO (Loranger, Janca, & Sartorius, 1995). There are two versions of this structured interview. The Spanish version, based on the DSM-IV (López-Ibor, Pérez, & Rubio, 1996), was used. This version allows for the assessment of different disorders from the different functioning areas of the personality, a key aspect of the dimensional model in Section III of the DSM-5. In addition, the interview includes a self-administered screening questionnaire, which selects the most relevant items to be assessed in the interview. The Personality Inventory of the DSM-5, PID-5-Adults (Krueger, Derringer, Markon, Watson, & Skodol, 2012, 2014). The Personality Inventory for DSM-5 (PID-5), Full version Adult, was used. It adopts the dimensional model, is a 220 item self-rated personality trait assessment scale for adults age 18 and older. It evaluates 25 facets of personality traits: Anhedonia, Anxiousness, Attention seeking, Callousness, Deceitfulness, Depressitivity, Distractibility, Eccentricity, Emotional Lability, Grandiosity, Hostility, Impulsivity, Intimacy Avoidance, Irresponsibility, Manipulativeness, Perceptual Dysregulation, Perseveration, Restricted Affectivity, Rigid Perfectionism, Risk taking, Separation insecurity, Submissiveness, Suspiciousness, Unusual Beliefs and Experiences, and Withdrawal. Certain triplets of facets (groups of 3), can be combined to assess the five domains of traits: Negative affect, Detachment, Antagonism, Disinhibition and Psychoticism. The clinician is asked to calculate and use average scores for each facet and domain, to a 4-point scale. Higher average scores indicate greater "dysfunction" in a specific personality trait facet or domain, and lower scores, point towards an adaptive and resilient personality. The five domains are maladaptive variants of the personality model known as the Big Five or Five Factors. They are also similar to the five domains of the psychopathological personality, Personality Psychopathology Five, PSY-5 (Anderson et al., 2014). In several studies the instrument showed good reliability and validity qualities (Al-Dajani, Gralnick, & Bagby, 2016; Bastiaens et al., 2016; Quilty, Ayearst, Chmielewski, Pollock, & Bagby, 2013). In its Spanish validation, the facets showed good internal consistency (α = .86 and .79), and discriminant validity between clinical and non-clinical subjects. It is noted that the upper poles indicate pathology and the lower poles normality, as well as the hierarchical structure of the instrument (Echeburúa, Salaberría, & Cruz-Sáez, 2014; Gutiérrez et al., 2015). Borderline Evaluation of Severity Over Time, BEST (Pfohl et al., 2009), developed by the authors of the STEPPS Treatment Program. A self-rated scale to measure severity and change over time in persons with BPD. It is composed of 15 items evaluated on a Likert type scale (1 to 5), which are grouped into three subscales. Both A Thoughts and Feelings (items 1 to 8), and B Negative Behaviour subscales (items 9 to 12), correspond to the DSM-IV-TR criteria for BPD. Each item is rated from 1 (none / slight), to 5 (extreme), in a selected time interval (30 days, 7 days, other). Subscale C evaluates Positive Behaviours (items 13 to 15), on a scale of 5 (almost always) to 1 (almost never). The instrument demonstrated moderate test-retest reliability (ρ = 0.62, n = 130, p < .001), high internal consistency (Cronbach's α .90 and .92), high discriminant validity and sensitivity to clinical change (Blum et al., 2002, 2009). For analysis, the direct scores of the three subscales were converted into a mean score, all of them oscillated between 1 and 5, making them comparable to each other. COPE-28, the Spanish version of Carver's Brief-COPE (1997; Carver, 1989;Crespo & Cruzado, 1997) by Morán, Landero y González (2009). This is a 28-item inventory, in which answers are obtained based on a Likert type ordinal scale. It is comprised of 4 alternative answers from 0 (I never do this), to 3 (I always do this). These items are grouped into 14 subscales of strategies or coping styles used by people in stressful situations: 1. Active coping, 2. Planning, 3. Use of emotional support, 4. Use of instrumental/social support, 5. Religion, 6. Positive reframing, 7. Acceptance, 8. Denial, 9. Humor, 10. Self-distraction, 11. Self-blame, 12. Behavioural disengagement, 13. Venting/venting of emotions and 14. Substance use. The authors found reliability with Cronbach's α coefficient test between .45 and .92, and a test-retest procedure of .46 to .86. This is a two-stage study. In the first stage, which this article focuses on, between June 2015 and January 2018, a descriptive, cross-sectional study was carried out at the San Juan Mental Health Day Hospital, Alicante. In the second stage, a study was conducted to assess the results of the program. The statistical analysis was performed with the SPSS package v15., using the Excel spread sheet as a supplement. Socio-demographic variables (age, gender, marital status, living situation, level of studies, employment status), and some clinical variables (use of health resources and clinical diagnosis according to DSM-5), were defined through descriptive statistics. These later define different profiles of the individuals, PD-NOS/MP and BPD. In the self-reports and quantitative instruments (PID-5, BEST, COPE-28), along with the descriptive analysis for the global sample, the means of the subgroups were compared according to the diagnosis (PD-NOS/MP vs. BPD). The Student's t-test of comparison of means for independent samples was used. To check if the equality of variances is assumed, the Levene test for Equality of Variances was applied in each comparison of means. The effect size for each pair of comparisons between groups was obtained using Cohen's δ, following the interpretation proposed by Cohen (1988). δ between .50 and .79 would, indicate a moderate effect, above .80 would be considered a large effect. As previously mentioned in the participants section, the main clinical diagnoses found for the 85 individuals admitted are; Borderline Personality Disorder (51 %), PD-NOS or Mixed Personality (47 %) and only 2 % Other Personality Disorders (Obsessive-Compulsive Personality Disorder and Histrionic Disorder). The Referral Sheet shows that amongst the 85 individuals, 65 % present at least one comorbid disorder. 17 % have Depressive Disorders including Dysthymia, 9 % have Anxiety Disorders, 8 % exhibit Obsessive-Compulsive Disorder (OCD), 12 % have Substance Use Disorder or Dual pathology (with Non Specific Anxiety Disorder), 5 % have Adaptive Disorder, 6 % have Psychotic or Schizoaffective Disorder, 4 % have Bipolar Disorder, 2 % have an Eating Disorder and 2 % have Attention Deficit Hyperactivity Disorder (ADHD). Upon reviewing individual records from the year prior to accessing the program, it can be seen that 100 % of the participants were being treated at their Mental Health Unit. There were a total of 23 admissions in the Psychiatric Hospitalization Unit, and 99 visits to emergency service. In addition, 10 of the individuals had been in other outpatients or long-stay departments (Addictive Behaviour Unit, Eating Disorders Unit, Dr Esquerdo, amongst others). - By gender, women make up 89 % of BPD, and 58 % of PD-NOS/MP. Thus women predominate in BPD, however, when referring to PD-NOS/MP, the percentages are relatively similar for men and women. - By age, 53 % of people with BPD are under 30 years old, 30 % are between 30 - 39 years old and only 17 % are over 40 years old. In the case of PD-NOS/MP 20 % of people are less than 30 years old, 47 % of people are between 30 - 39 years old and 33 % are over 40 years old. So it seems that the BPD group is younger. - With regards to comorbidity, 72 % of the PD-NOS/MP group and 61 % of to BPD group have some comorbid conditions. The PD-NOS/MP group shows a higher percentage of anxiety disorders and psychotic disorders, and BPD group has a higher percentage of Bipolar Disorder, although the differences are not significant. 70 patients completed the PID-5, although in order to obtain more representative results, two cases with different specific diagnoses, Obsessive-Compulsive Personality Disorder and Histrionic Disorder were excluded. Therefore, for this test, the results of N = 68 were analysed, 37 of which belong to the BPD subgroup, and 31 belong to the PD-NOS/MP subgroup. The scores in the PID-5 are expressed in a Mean Score (M), for each domain and facet, ranging between 0 and 4. Higher mean scores (M = 4), indicate greater "dysfunction" in the facet or domain. At the start, the group as a whole obtained the highest score in the Negative Affect domain (M = 1.95, SD = .57), followed by Disinhibition (M = 1.69, SD = .62), Detachment (M = 1.42, SD = .57) and Psychoticism (M = 1.19, SD = .65). The lowest score obtained is Antagonism (M = .64; SD = .51). It follows that the patients included in the program stand out for being high Negative Affect, which, as defined in the DSM-5, implies having "frequent and intense experiences of high levels of varied negative emotions and their behavioural and interpersonal manifestations, as well as irrational ideas and difficulty facing stressful situations". With regard to Facets, the means and standard deviations can be seen in the following Table 1. Table 1: Scores in the Facets of PID-5 for the total group. Means and Standard Deviations. As can be seen in this table, at the beginning the following Facets stand out: Lability (M = 2.20, SD = .71), Anxiousness (M = 2.11, SD = .59), Depression (M = 2.04, SD = .72), Anhedonia (M = 1.90, SD = .61), and Impulsivity (M = 1.91; SD = .88). They have means that are higher than or close to 2. It is clear in the PID-5 PRE that patients included in the program need treatment focused on Negative Affect (lability, depression, anxiousness and anhedonia) and Impulsivity. It suggests there is a need to intervene both in emotional and behavioral regulation, in irrational beliefs, as well as in coping with stress. If the group that returned the questionnaire in the PID-5 is divided into subgroups according to the diagnosis at admission, it can be seen that from “N = 68”, 37 are diagnosed with BPD, and 31 are diagnosed with PD-NOS/MP. There are noticeable differences between these two groups in the PID-5. When comparing in the PID-5, BPD subgroup to the PD-NOS/MP subgroup, noticeably higher scores can be observed in all domains (greater dysfunction), except in antagonism. The Negative Affect Domain stands out (M = 2.09, SD = .50), followed by Disinhibition (M = 1.85, SD = .56). Regarding Facets, Lability (M = 2.40, SD = .55), Depression (M = 2.27, ST = .50), Anxiousness (M = 2.21, ST = .61), Impulsivity (M = 2.13, SD =. 79), Anhedonia (M = 2.03, SD = .49), and Distractability (M = 1.96, SD = .60), all stand out. It is worth highlighting that according to the DSM-5, Section III, in order to diagnose BPD, four or more of seven pathological features should be present. At least one must be (5), (6) or (7). These include: 1. Emotional lability 2. Anxiousness, 3. Separation Insecurity, 4. Depression, 5. Impulsivity, 6. Risk-taking 7. Hostility. As can be seen, these conditions are met in this group, meaning, therefore, that they are correctly classified in this diagnostic category. On the other hand two prominent facets can be found, Anhedonia and Distractability. Distractability is part of the disinhibition domain, and is defined as "difficulty concentrating and paying attention to tasks; easily distracted by external stimuli; problems with fulfilling goal-oriented behaviours, such as planning and performing tasks". These two facets can have an effect on difficulty with following a therapeutic program, so they should be taken into account when considering the type and mode of intervention. The PD-NOS/MP subgroup, obtains lower scores in all the domains compared to the BPD subgroup, except in antagonism, although there aren't any scores close to 2 in any domain. However, when observing the facets, scores in lability (M = 1.97, SD = .81), and anxiousness (M = 1.99, SD = .55), stand out. Up to this point, when using the PID-5, it can be deduced that the patients referred, who are diagnosed with PD-NOS/MP essentially need an approach that tackles lability and anxiousness. Having seen the profiles, it is necessary to determine whether the differences between the BPD group and the PD-NOS/MP group, in mean scores of the Domains and the Facets of the PID-5 are statistically significant. For this, the Student's t-test for independent samples was used. This data is collected in Table 2. Table 2: Scores in PID-5. Differences between BPD and PD-NOS/MP, Student´s t-test comparison of means for independent groups. As Table 2 demonstrates, the Domains in which significant differences have been found (p < .05), with an Medium effect size for Cohen's delta (Cohen, 1988), are Negative Affect (t (66) = 2.23, p < .05), and Disinhibition (t (66) = 2.37, p < .05). With regard to Facets, significant differences have been found between both groups. In Depression (t (47) = 2,965, p = .005), the difference is significant of p < .01, and the effect size would be Large (Cohen, 1988). Differences can be found at .05, with Medium effect sizes, in Lability (t (51.6) = 2.476, p = .017), Impulsivity (t (66) = 2.376, p = .020), Distractability (t (66) = 2.026, p = .047), and Eccentricity (t (66) = 2.006, p = .049). As can be seen, the BPD not only obtains higher scores in these facets, but the differences between both groups are significant. It is noted that this group also scores high in Anhedonia, despite the difference not being significant. These profiles point towards a global need to address Negative affect, especially Lability and Anxiousness. For the specific case of BPD, it is also necessary to address depression, and there is a particular need to address the disinhibition domain (impulsivity and distractibility facets), and eccentricity. As previously mentioned in the methodology, BEST includes 15 items that are grouped into three subscales. Subscale A, Thoughts and Emotions (items 1 to 8), Subscale B, Negative Behaviours (items 9 to 12), and Subscale C that evaluates Positive Behaviours (items 13 to 15). With a view to making the scores from different sections comparable, the direct scores from each subscale A, B and C, were converted into mean scores, oscillating between a minimum score of 1 and a maximum score of 5. The first month's mean score was used as the baseline for each subscale and item, that is, the mean obtained in the first 4 sessions of treatment. The main interest is not only in knowing the profile of the global group, but also in finding out if there are significant differences between the two BPD and PD-NOS/MP groups analysed in subscales and items. Given that not all the patients admitted to the DH stay in the program for the entirety of the first month, a n = 65 was found, in which 34 patients belong to the BPD subgroup and 31 belong to the PD-NOS/MP subgroup. For subscales A-B-C and items, the means obtained in the first month by the group are shown in Table 3 below. Table 3: Global group scores in BEST. Means and Standard Deviations in the subscales and items. It can be observed that the items with the highest score in the first month are mood instability (M = 3.539, SD = 1.18), and chronic feelings of emptiness (M = 3.43, SD = 1.263), followed by changes in how patients see themselves (M = 3.159; SD = 1.180). In a positive sense, the item that by far scores the highest in the questionnaires is following therapeutic instructions (M = 4.044, SD = .969). If the differences between the BPD and PD-NOS/MP group are analysed, with Student's t-test for independent samples, significant differences in all subscales with a Large effect size (p < .01; δ > .80), in subscales A (t (63) = 3.221, p = .002, 95 % IC = (.254, 1.088), δ Cohen = .79), and B (t (63) = 3.855, p <.000, 95 % CI = (.390, 1.232), δ Cohen = .95). And a Medium effect size in subscale C (t (63) = -2.414, p = .019, 95 % IC = (-.889, - .083), δ Cohen = .59). Therefore, the BPD group scores higher in subscales A and B, whilst the PD-NOS/MP group does so in subscale C. This would indicate that not only does the BPD group have significantly more intense symptomatology (cognitive, emotional and behavioural), but also in comparison to the PD-NOS/MP group, they use coping behaviour less frequently for their symptoms. When the BEST items are compared in the first month, the BPD group score higher on all items except those related to coping behaviours (conversely for PD-NOS). It is necessary to point out that although the groups coincide in the items that receive the highest scores (chronic feelings of emptiness and extreme changes in how they see themselves); there are significant differences between them. 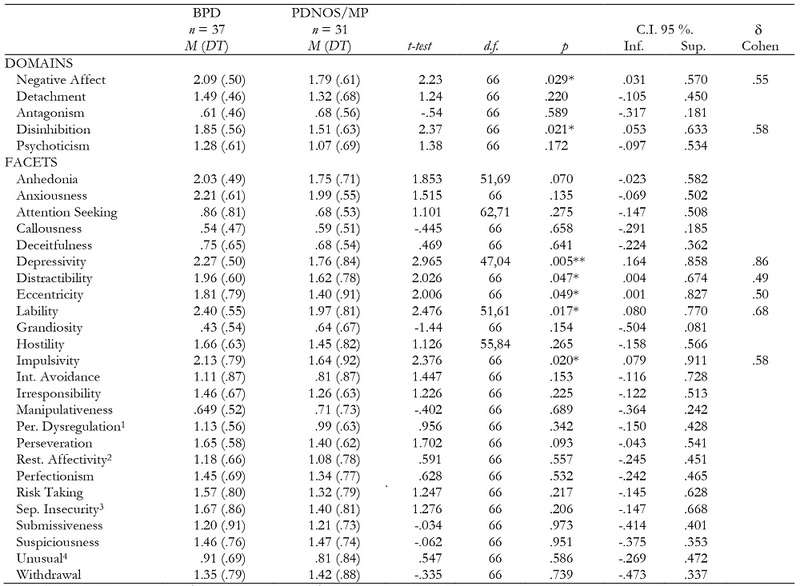 In fact, the difference in means in the items between the BPD group (n = 34), and the PD-NOS/MP group (n = 31), is significant in most items, as can be seen in Table 4. Table 4: BEST ratings. Differences between BPD and PD-NOS/MP, Student´s t-test comparison of means for independent groups. Thus a significant difference of p < .01 and a Large effect size (Cohen's δ > .80), for items: 3-changes in identity, 4-changes in mood, 8-ideas of suicide, and 11-impulsive behaviours are found. There is a significant difference of p < .05, and a Medium effect size (Cohen's δ > .50), for the items: 2- opinion of others, 7-feelings of emptiness, 10-getting hurt or attempting to commit suicide, and 12- fits of anger or problems controlling it. When the differences in items are observed, the BPD group has significantly more intense symptomatology (cognitive, emotional and behavioural), when compared to the PD-NOS/MP group. 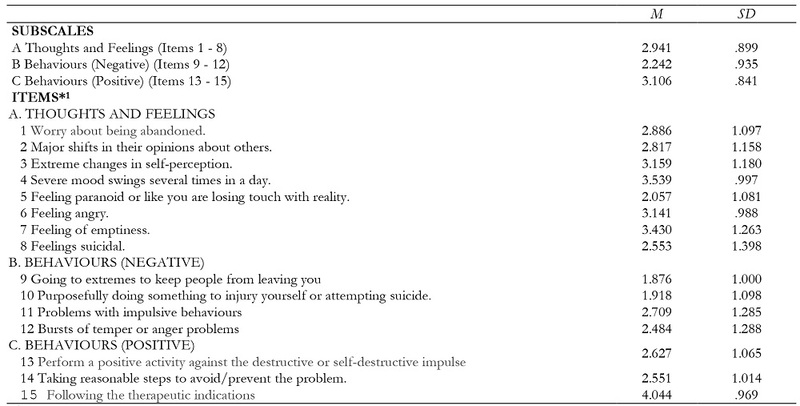 Ideas and suicidal behaviours (items 8 and 10), as well as the impulsive behaviours (item 11), are of particular importance, which imply that this group needs to be monitored more closely during the therapeutic process. In relation to stress coping strategies, 61 subjects completed the questionnaire COPE-28. The scores in each coping strategy range from 0 to 6, depending on the frequency of use of the strategy. The most frequently used strategies (M > 3), by this group are: Use of instrumental/social support, Active coping, Use of emotional support, Self-distraction, Venting/venting of emotions and Self-blame. Those that are used with less frequency (M < 3), are: Planning, Positive reframing, resorting to Religion, Substance use, Behavioural disengagement, Denial of having problems and Humour. When PD-NOS/MP and BPD groups are compared, with Student's t -test for independent samples, they score similarly in all strategies, with the exception of BPD scoring significantly higher in Self-blame (t (59) = 2.40, p = .019, 95 % CI = (.161, 1.763), Cohen δ = .86), and Substance use (t (59) = 2.062, p = .044, 95 % IC = (.030, 2.011), Cohen δ = .687). These results point to the need to address strategies such as positive re-framing, self-blame and venting/venting of emotions (appropriate expression of emotions). When referring to BPD, it is also necessary to develop alternative strategies to drug use to cope with stress. Prior to conducting a structured IPDE interview, a questionnaire is administered that allows for the selection of the most relevant items to be asked in the interview. It is necessary to point out that this is not a diagnostic instrument; however, the study's intention was to consider to what extent it could be used to help provide a diagnosis and establish whether the results conform to the initial diagnostic. On the other hand, to compare any possible differences in the IPDE between the two groups (BPD and PD-NOS/MP). The analysis of the two cases with diagnoses other than BPD or PD-NOS/MP is excluded from the analysis. In the total group (N = 68), 76 % of cases (n = 52), meet the necessary number of criteria to consider BPD as a probable diagnosis. 53 % of the subjects (n = 36), meet the necessary number of criteria to consider Avoidant Personality Disorder as the diagnosis. However, of the 68 cases, only 20 % meet the necessary number of criteria to consider a single diagnosis, compared to 67 % that meets the necessary number of criteria for two or more disorders. There is even 13 % that do not meet the necessary number of criteria to be diagnosed with any type of disorder. These data in the IPDE disagree with the initial diagnoses by which they have been derived to the resource, contributing confusion in the diagnosis. If we observe by diagnosis, in the PD-NOS/Personality Mixed subgroup, in analysing the frequencies, out of the 31 cases, the 55 % cases meet the criteria for at least two disorders, and 5 cases (17 %), do not meet criteria for any specific disorder. Nevertheless, 8 cases (28 %), can be seen to meet the necessary number of criteria for a single diagnosis, out of these, 5 cases (17 %), exclusively meet criteria for BPD. Therefore, with the IPDE data, at least 28 % would be incorrectly classified in the PD-NOS/MP category. The subgroup diagnosed with BPD (n = 37), taking into consideration the means and in the frequency of cases for each one, scores more features in all of the subscales of the IPDE. Borderline and evasive subscales stand out. Precisely in these scales they have a significant difference between both groups (BPD vs PD-NOS/MP), with the Student´s t-test for independent samples, in the Limit scale (t (63 )= -2.99, p = .004, 95 % IC = (-2.858, -.561), δ de Cohen = .78), and the Avoidant scale (t (63) = -.546, p = .014, 95 % IC = (-2.144, -.25685), δ de Cohen = .658). In analysing the frequencies, the subgroup BPD, it can be observed that of the 37 subjects, only 5 meet the criteria for a single disorder, and only 2 of these subjects (6 %), meet the criteria for BPD. The other 32 (94 %), meet the criteria for the diagnosis of 2 or more disorders. Therefore, for the BPD group, the IPDE suggests that 94 % of the cases would be considered as having Mixed Personality Disorder, so they would be incorrectly classified as BPD. This result contrasts with the results seen in the PID-5, where this group obtained a profile of traits that complied with the BPD criteria according to the dimensional-hybrid model. Summarizing the data obtained about the patients referred to the Day Hospital for Personality Disorders, in general the derivations conformed to the expected diagnoses (clusters B and C), only 10 % do not meet entry criteria. 16 % dismiss the application. Out of the 85 individuals that enter, 75 % are women and 25 % men. This can be due to the fact that in the clinical populations, the personality disorders addressed have a higher prevalence in females, especially BPD, amongst other reasons. The average socio-demographic profile of patients accessing the centre are women, under 40 years of age, who live in a family home, with basic or intermediate levels of education, unemployed and without their own income. Clinically speaking, the main diagnosis of the patients referred is Borderline Personality Disorder, totalling 51 %. PD-NOS/MP makes up 47 %, and 2% have other specific disorders (OCD and Histrionic). On the other hand, 65 % have at least one comorbid disorder in a stable phase. 21 % are mood disorders, 21 % are Anxiety Disorders (including adaptive and OCD), 12 % have a Substance Use Disorder or Dual pathology, and 6 % a psychotic disorder. Regarding clinical severity, it is necessary to consider that over the course of the year prior to their entry into the program, together they make up a total of 23 admissions in the Psychiatric Hospitalization Unit and 99 visits to the Emergency Service. When there is a differentiation by diagnosis the socio-demographic and clinical characteristics indicated, slight differences are found in the profile. When considering gender, 89 % of BPD and 58 % of PD-NOS/MP patients are women. By age, 53 % of BPD patients are under 30 years old, and 30 % are between 30 - 39. 47 % of PD-NOS/MP patients are between 30 - 39, and 33 % are over 40 years old. The profile found in BPD is as expected, as observed in different investigations (Mental Health Forum & AIAQS, 2011). Regarding comorbidity, 72 % of the PD-NOS/MP subgroup shows some comorbidity, compared to 61 % of the BPD group. Although the disorders are equally spread across both diagnostic groups, psychotic disorders are concentrated to the PD-NOS/MP group and bipolar disorders are concentrated to the BPD group. This clinical profile has important implications for the design and implementation of a Treatment Program with these patients. On the one hand, there is currently no specific treatment based on evidence, nor clinical guidelines on how to handle/manage a PD-NOS/MP diagnosis, even though it accounts for almost half of the referred patients. There is also an added need to consider how to manage comorbid pathology during treatment, even if it is not the primary treatment focus. Beforehand, depending on the diagnosis given at the beginning (BPD vs. PD-NOS/MP), differences in the therapeutic needs were expected. These differences are shown in the PID-5 and in the rest of the instruments used, many of them being statistically significant and in comparisons between the groups, Cohen's delta registering as a medium or high measured effect size. In the profile of Domains and Facets in the PID-5 for the total group, it is observed that the highest scores are obtained in the Negative Affect Domain and related facets (lability, depression, anxiousness and anhedonia), as well as the Impulsivity facet. This already directs towards the need to intervene both in emotional regulation and its expression, irrational beliefs, coping with stress and self-control. When comparing the subgroups, the BPD subgroup in the PID-5 is differentiated by a profile with higher scores in all the Domains, especially in Negative Affect and Disinhibition. Similar results were found in previous studies when these patients have been assessed using the Five Factor model (Verardi, Nicastro, McQuillan, Keizer & Rossier, 2008). Probably the dimension of Negative Affect is closely related to the difficulties of emotional regulation in this disorder, which have been the subject of study and intervention in multiple investigations (Glenn & Klonsky, 2009; Gratz, Moore & Tull, 2016; Rosenthal et al., 2008; Rufino, Ellis, Clapp, Pearte & Fowler, 2017). Moreover, in depression, lability, impulsivity, distractibility and eccentricity Facets, the BPD group not only obtains higher scores, but the differences between both groups are significant. In addition, high scores in impulsivity, anhedonia and distractibility, could imply difficulties in following a therapeutic program, so it is necessary to take them into account for the assistance (Black, Allen, St. John, Pfohl, McCormick & Blum, 2009). For the PD-NOS/MP subgroup, the profile in PID-5 is characterized by lower scores in all domains, and none of them have an average score close to 2. However, the scores obtained in lability and anxiousness facets stand out. Therefore, these facets are those, which need more attention in this particular group. In the IPDE interview questionnaire, the most frequently detected disorders found in both groups are Borderline and Avoidant Personality disorders. Other studies also found a high frequency of personality disorders in Cluster C in patients diagnosed with BPD (Verardi, Nicastro, McQuillan, Keizer & Rossier, 2008). However, from a categorical perspective there is a serious problem when it comes to helping provide a single diagnosis when using the IPDE. 67 % would be classified as having Mixed Personality Disorder and only 7 subjects (10 %), coming from both BPD and PD-NOS/MP groups, could be diagnosed with BPD. Therefore, from this categorical evaluation, contrary to what we found with the PID-5, doubts are raised regarding the main diagnosis for which they are referred. In BEST, profile severity is different for BPD and PD-NOS/MP subgroups. The BPD group score higher in subscales A and B and lower in subscale C (conversely for PD-NOS/MP). The differences are statistically significant, meaning that in addition to having a more intense symptomatology, coping behaviours for their symptomology are used less frequently. The intensity of suicidal thoughts and behaviours, as well as impulsive behaviours, imply that this group needs to be monitored more throughout the therapeutic process. In the COPE-28, it is observed that both groups usually use strategies to cope with stress such as use of instrumental/social support, Active coping, use of emotional support and Self-distraction. They score high in Venting/venting of emotions and Self-blame strategies, and low in Positive re-framing. Moreover, the BPD subgroup uses substances significantly more. This could be considered as "evasive" coping strategies, consistent with the results in the IPDE and with previous studies on the relationship between neuroticism (negative affect), and evasive strategies (Silva, 2014). The Day Hospital attempts to address these identified needs by offering the patient a diagnostic assessment and a specific, intensive and interdisciplinary treatment. The approach is comprised of various therapeutic components, to ensure the patient is treated according to their needs and dysfunctional features. This is done by observing specific individual and group interventions, for each disorder and each individual. Moreover, by collaborating and working with the patient's environment (family). We highlight two specific subprograms, STEPPS (Black, Blum, Pfohl, & St John, 2004), and Iconic Therapy (Santiago, 2013), as two of the components that try to respond to the needs detected in these patients. One of the limitations of this piece of work is that it is a cross-sectional descriptive study, which only allows for the consideration of the profiles upon the patient's admission. It also comes from a sample, which is limited to those patients who are referred to the centre. A possible option for future research would be to try to expand the sample by including individuals of identical diagnosis, who, however, are not referred for treatment at the Day Hospital. For example, coming from outpatient treatment in Mental Health Units. On the other hand, given that the sample is not very large, it would not be possible to apply the conclusions to other individuals with the same diagnosis (BPD and PD-NOS/MP). In future studies a larger sample that allows for the study to make these inferences is desired. The logical consequence of this first descriptive investigation is the analysis of effectiveness of the program that has been implemented, exploring the magnitude of the change (effect size), for the entire group and each diagnostic group. This descriptive study has tried to contemplate the usefulness of addressing serious personality disorders from a dimensional perspective, and according to the features that are compiled in Section III of the DSM-5, instead of exclusively maintaining the classic categorical model. To this end, it has tried to show the usefulness of applying an instrument such as the PID-5 to clinical practice. This instrument guides towards specific personality diagnoses, such as BPD, at the same time as being able to describe trait profiles and therapeutic needs of PD-NOS/MP patients. In the BPD group, a greater representation of woman is observed, under the age of 30. In the PID-5 show a profile of greater global severity, and points out the necessity of addressing, above all, negative affectivity and disinhibition. In this group, anhedonia and distractibility are variables to consider, since they can influence therapy. The greater intensity of symptoms such as suicidal thoughts and behaviours, as well as a lower tendency to use coping strategies, mean that this group requires more intensive monitoring. They also present more evasive coping features, and make use of strategies to avoid dealing with stress. Therefore, this should be another intervention objective. On the other hand, the PD-NOS/MP group is distributed in both genders equally, in patients over 30 years old. In comparison, they present higher secondary comorbidity. Within heterogeneity, they show Borderline and Avoidant traits. Needs are centred above all on negative affect, especially emotional Lability and Anxiousness. They need to work on coping strategies such as appropriate expression of emotions, positive reframing and Self-blame. Therefore, the use of PID-5 has allowed for a better understanding of the needs of each group so a therapeutic program can be adapted appropriately. On the other hand, after the intervention, it allows for the evaluation of the results obtained in Borderline Personality Disorder, as well in the Mixed Personality Disorder and PD-NOS, a heterogeneous group that is usually excluded from research studies. Thanks to all the team of the Day Hospital for Personality Disorders of the Hospital of San Juan de Alicante.